Tropical Villa Stunning Ocean View. Other than getting the most incredible view of Lamai and the southern gulf of Thailand, the four bedroom villa offers guests all the necessary features for a truly enjoy an unforgettable vacation. For a relaxing evening simply soak yourself in the Jacuzzi or take a dip in the infinity swimming pool. The pool terrace is also great for outdoor entertaining with a BBQ. Eye-pleasing green gardens are sure to have a calming effect during the day if you choose to lounge around. 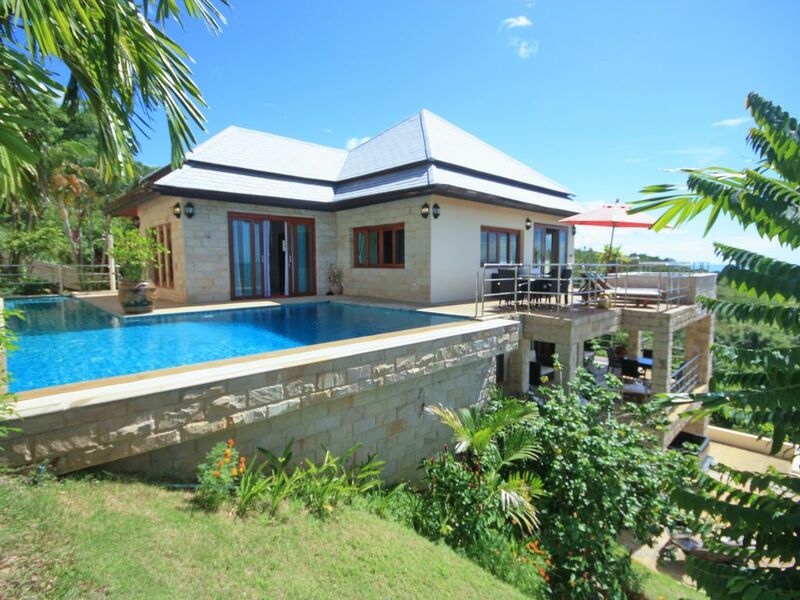 The two storey villa can be rented as a whole or guests can choose to occupy only one level. Either way, you will be in close proximity to restaurants in the surrounding neighborhood. Each level includes a kitchen if you feel like some good home-cooking. Both levels have a western kitchen and can operate independently from each other. To complete your stress-free getaway, the villa has 24-hour security to keep you and your loved ones safe. Location The villas prime location four kilometers from Koh Samuis famous Lamai beach means its near plenty of restaurants, markets and shops. When you feel like doing something fun, head to the island safari to check out the local wildlife or ride an elephant. The Butterfly farm can be a magical experience for visitors of all ages. For a more serene holiday, temples, beaches, and the rain forest are all within your reach. Distance from villas. I live in Koh Samui Thailand, I have lived here for the past 12 years. I built two villas years ago. I am from Guernsey in the Channel Islands. Tropical villa has such stunning sea and jungle views. The picture changes every day with the weather, but always fantastic. At night it's amazing with all the fishing boats out on the horizon fishing for squid with there green lights on. Tropical villa is situated on the mountain side, so even in the hottest days there is alway a sea breeze which helps keep mosquitos away. Very young children not recommended due to open pool plan. But at parents discretion. Smoking welcome on terrace out side areas. X Box 360 Games system with games. Wir waren mit 4 Personen im Juni in der Villa. Schon der erste Kontakt mit Bob dem Vermieter war super freundlich und nicht zu toppen. Doch als wir das Haus erreichten waren wir alle erschlagen und fasziniert von der Aussicht und dem Luxus im Haus. Bob war jederzeit für uns da, man musste ihn nur anrufen und sofort war jemand zur Stelle. Einen Mietwagen hat er uns auch besorgt, der zum Haus gebracht und auch dort wieder abgeholt wurde. Ein riesen Lob geht auch an das Hauspersonal: Eines morgens sind wir nach dem Frühstück direkt zum Strand gefahren ohne zu spülen. Als wir abends zum Haus kamen, war alles gespült und wieder fein säuberlich verräumt. Der Urlaub war ein absoluter Traum!! Wir waren mit 6 Personen im Mai 2009 für zwei Wochen in der Villa. Alles entsprach der Beschreibung, wir waren sehr zufrieden. 4 Schlafzimmer, jeweils mit eigenem Bad, beide Appartments sehr ansprechend ausgestattet und sauber. Der Pool und der Ausblick von allen Zimmern ist einzigartig! Einziges Manko: Man benötigt einen Mietwagen. Was aber kein Manko sein muss, da man so sehr flexibel auf der Insel unterwegs ist. Den Mietwagen hat Bob, der Vermieter besorgt, er hat sich überhaupt ständig gekümmert und war sehr freundlich! Wir haben nur in der Villa gefrühstückt, ansonsten waren wir mittags und abends jeweils essen. Die Preise in den Restaurants sind so günstig, dass man nicht selbst kochen muss. Wir können die Villa nur jedem wärmstens weiterempfehlen. Ein besseres Preis-Leistungsverhältnis ist kaum zu bekommen und dazu noch einen Vermieter, der sich richtig kümmert und stets erreichbar ist. Villa is located near Lamai, which is a busy holiday town, with a golden sandy beach. There is a wide variety of good sea food restaurants that cater for every taste. The shopping is cheap to western standers. There are several tourist attractions that are close by, elephant treks, jungle tours, water falls, tiger zoo and many more. The south side of Koh Samui with its unspoilt beaches, coconut plantations, quaint fishing villages and markets. To the North of the Island is the main town of Chawang, here you have many restaurants, good shopping, beaches and good night life. These rates are for 3 to 4 bedrooms. Up to 8 persons Discounted rates of 30% for 1 to 2 bedrooms. Up to 4 persons, please get in touch with owner. Rates are fully inclusive of; Airport Tax, daily maid service, linen, welcome food & drink pack. 50% deposit on booking. Full payment min 30 days before arrival.